Serious car enthusiasts will recognize the Studebaker brand of services and automotive parts, even if it has been out of the industry for decades. Studebaker was known for manufacturing luxury vehicles and contributed much to the development of the automobile, so much so that it has its own museum. A Studebaker Neon Clock makes a great gift by providing a reminder of history to display in the collector's inventory. Image Time guarantees the quality and reliability of this clock which will run perfectly for many years to come. Image Time manufactures clocks to the highest degree of quality. These clocks will tick accurately for hundreds of thousands of hours without fail. Studebaker Neon Clocks make wonderful gifts for car hobbyists, especially those who enjoy luxury models and history! Subject: Neon Clock for Studebaker fans and enthusiasts. 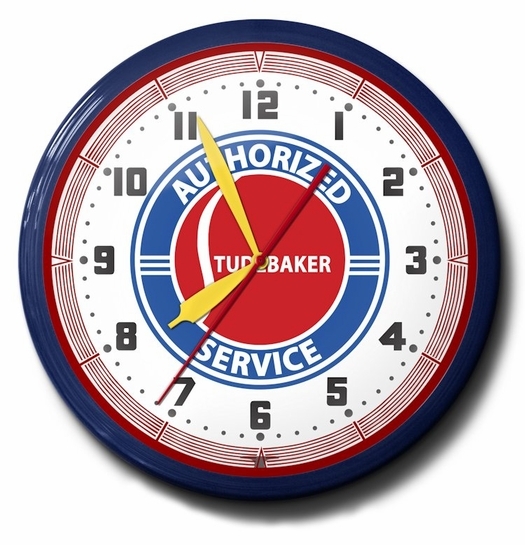 Ask a question about Studebaker Authorized Service Neon Clock, High Quality, 20 Inch.